Benjamin Shoup, one of several members of the Shoup family buried at Salem, served in a fighting unit that participated in the famous siege of Vicksburg, Mississippi, in 1863. Vicksburg fell to the Union Army in July of that year. It was a pivotal victory in the war, giving the Union control of the Mississippi River transportation and shipping routes. After the war, Shoup served as a Hebron police constable. 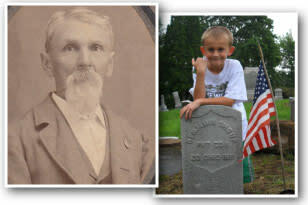 Shoup is one of three Civil War veterans whose graves received new granite headstones through the efforts of the Calumet Region Civil War Preservation Project. Joseph Sweet&apos;s regiment, the 9th Indiana, was among the first Indiana volunteer fighting units raised by the state in response to President Abraham Lincoln&apos;s call for troops in 1861. Upon Sweet&apos;s death in 1869 – four years after the war&apos;s end – the federal government issued him a marble veteran&apos;s headstone. However, the stone went missing several years ago, and Sweet&apos;s grave sat unmarked until receiving a new stone in 2011 through the efforts of the Calumet Region Civil War Preservation Project. Benjamin Sheffield&apos;s marble government-issued grave marker appeared to be missing from its gravesite for many years. It actually was lying flat on his grave and buried under several inches of dirt until it was recently unearthed. 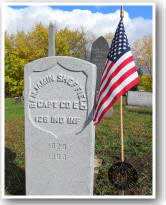 The inscription was severely faded, and Sheffield&apos;s grave received a new granite marker through the efforts of the Calumet Region Civil War Preservation Project. As a captain, Sheffield would have been in charge of Company E. At the beginning of the war, companies were smaller units of about 100 men within larger regiments, which typically contained about 1,000 soldiers. However, as the war waged on over the course of four years, some regiments shrunk to a few hundred men and some companies to a few dozen or less as the attrition of disease, battle and infection took its toll. Born in Ireland, Stewart eventually settled as a farmer in Porter Township and Hebron, Indiana. At the time of his death, he left behind a wife and six children. Stewart belonged to the hard-fighting 9th Indiana Infantry, made up largely of men from LaPorte and Porter counties. He enlisted in the 9th Infantry in 1862, the second year of the war, and served for the war&apos;s duration. Stewart is buried a short distance from Cpl. Joseph Sweet, who would have served closely together with Stewart in Company E. Among dozens of battles in which the 9th participated was the Battle of Stones River in early 1863 near Murfreesboro, Tennessee. Following the bloody battle, some men from the 9th helped build Hazen&apos;s Monument, which is not the oldest standing Civil War monument in the country. It stands today as a memorial to the 23,500 casualties during three days of some of the war&apos;s most brutal fighting. 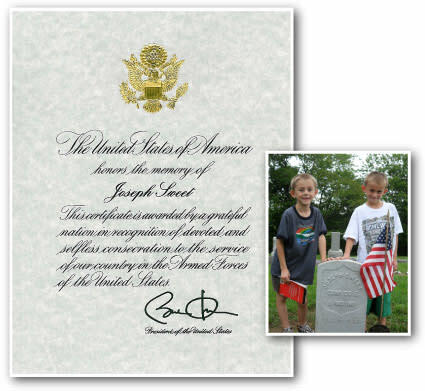 Myron Sweet&apos;s brother, Joseph Sweet, also is a Civil War corporal buried at Salem. The Sweet burial plot is located near the eastern edge of the cemetery.